gluten-free pizza crust, updated | gluten-free glory! One of the best things about getting together with family is picking up new recipes or ways of making old ones. I wrote this at home, in December, on pizza night: my brother Dan has a great recipe, and a better method than mine. Using my old standard for the ingredients, I followed his method. It takes longer, but the results were pretty fabulous. Another good thing about this specific trip home was the chance to try out King Arthur’s gluten-free multi-purpose flour. I could have tried it long ago at home (the other home – Boston), but a 24oz box is typically $8-9 in the grocery store here, so I’ve been reluctant to test it. While picking up groceries at Meijer for Christmas dinner, however, I noticed that King Arthur was on sale for less than $6! I grabbed a box, and tested it out on this pizza dough. When I wrote this paragraph, the dough was still rising in the refrigerator, so see the next paragraph for taste results. At this point, though, I was pretty blown away. Dan’s method calls for mixing with a dough hook; since he was using that for his gluten-full dough, I used a wooden spoon to combine the ingredients, and then my hands to knead it into shape. Typical gluten-free flour mixes make a super-sticky dough; kneading is next to impossible because my hands get covered in dough. 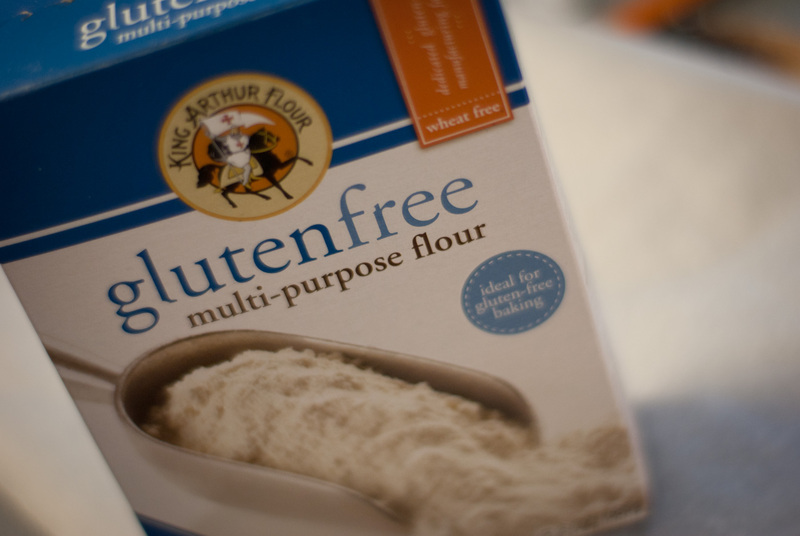 King Arthur gluten-free flour mix, however, acts like normal flour: it lets me knead to my heart’s content, and doesn’t leave my hands covered in dough. It has a lovely elasticity I’m not used to, and seems to have made a smooth, not-gritty dough. I can’t wait to taste this pizza. Pour water into a small bowl and dissolve brown sugar in it. Sprinkle the yeast over the top, then cover with plastic wrap and let sit for 5 minutes while you mix the dough. In a medium bowl, combine gluten-free flour and xantham gum. Add oil and water-sugar-yeast mixture and stir with a wooden spoon until most of the crumbs are incorporated into the dough. If the dough is dry or won’t incorporate, add more warm water, no more than 2-3 Tbsp at a time. Add salt, and mix a little longer to incorporate. Remove dough from bowl and knead on a clean, dry surface (or a piece of parchment paper) for a couple of minutes to smooth and incorporate the dough. Form into a ball and return to bowl; cover with plastic wrap and refrigerate for 6-8 hours. Preheat oven to 375 degrees. If you have a pizza stone, one that has never been used for gluten-full pizza – the cross-contamination is enough for celiacs like me to get sick! – stick it in the oven while preheating. Roll out dough to desired thickness (recommend 1/4-1/2 inch) on a level, lightly-gf-floured surface. Line a cookie sheet with parchment paper, or sprinkle your pre-heated pizza stone with cornmeal, then transfer pizza dough onto it. Brush dough with olive oil and top with your favorite sauce, cheese, veggies, meats, and any other good pizza toppings. Bake for 20-25 minutes, until crust and cheese/veggies are golden brown. Slice and serve! Hi there, I ennjoy reading through your post. I like tto write a little comment to support you.